What did you do in the 90’s, Daddy? 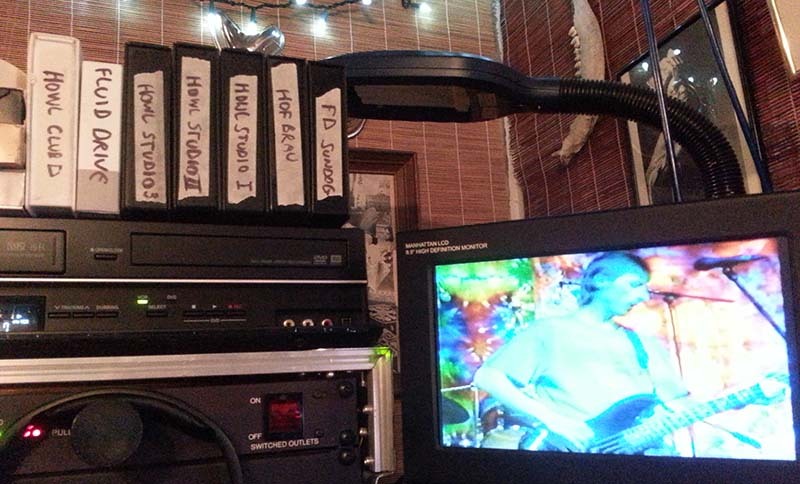 As promised, I have finally uploaded some archival VHS footage from this summer’s basement purge. 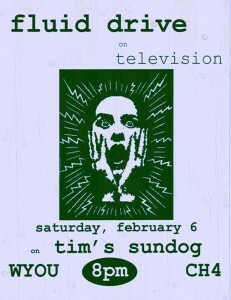 Back in 1997, my band Fluid Drive appeared on a local cable access show, ‘Tim’s Sundog’ – a Grateful Dead-themed music show that ran for several years in Madison, WI. I had never watched the tape until this year, and, as expected, I cringed a little. But I was also proud – and pleasantly surprised – to see how well we played. As exciting as it was to play on the tee-vee, my band was not a good fit for this show. Our songs were mostly terse and angular – nothing like the trippy noodling of the Dead. When we played covers, they were by Devo and Killdozer – a far cry from ‘Sugar Magnolia’ or ‘Uncle John’s Band.’ My rapport with addled host Tim Corcoran (as you’ll see in part 2) was less than complete and rife with misunderstanding. In short, I was a dork. All dorkiness aside, Fluid Drive rocked this show. 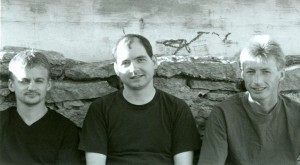 Dave Reinke (bass) and Todd Schroeder (drums) were the best rhythm section I have ever worked with, and they made my junky songs shine. I miss those guys. This video (and the next 2 to come) shows Fluid Drive at our best. It might not have been the right venue, but we sung true. This video was from Fluid Drive’s second live performance on WYOU. Our first show – a bizarre, semi-unscheduled visit on Biff Blumfumgagnge and Blunt Rapture’s “Hey, What’s the Big Idea?” – has thankfully not survived on video. 4 or 5 years later, when I returned to Tim’s Sundog with Ingenious Whittler, I found the tie-dye-draped set to be still intact – and the experience just as bizarre. During the recent basement purge at the Graham residence, many music related artifacts were brought to light. There was the handheld karaoke machine that was used as a guitar amplifier on Abe Lincoln’s Father’s Boss. There was a box of rusty drum hardware. There were over one hundred 4-track master tapes, filled with my dubious musical legacy. And then there was the box of video cassettes – dusty reminders of pre-digital life. Their bulky presence seemed to lend a degree of comfort to one’s living room, and those big, fat spines certainly made it easy to locate that copy of Mrs. Doubtfire on a Saturday evening. Some of these VHS tapes went directly to the St. Vincent de Paul bag (Bob the Builder), and others were slightly harder to part with (adieu, Ren & Stimpy!). But here also were several tapes of -gulp- me. Or, rather, tapes of two of my old bands, Fluid Drive and Howl, captured on stage, in the recording studio, and on television. I had never really sat down and watched these tapes. Rather than subject myself to the humiliation of seeing my dorky self perform (and maybe learn what not to do the next time), I had simply thrown these tapes in a box and carried on. What I found (when I finally located a VHS machine) was that my stage presence wasn’t (quite) as geeky as I remember, and that the old songs still rock. The video technology may be hopelessly dated, but the music is (mostly) not. I used to have bands, and they were good. The world’s most psychedelic cable access show! The Devo cover that time forgot! Proof that Brad once had hair! Circus Peanuts laced with LSD! I can smell the popcorn.